Can Stones Really Talk to us? Take a walk sometime, watch for a stone that seems to grab your attention... pick it up, turn it over a few times and look for images on it's surface. Allow those images to relay words to your mind. Those words will be the message from the stone - for you. This a simple form of stone divination, looking and listening within - to dive in - "divine" an answer to a question. These "TellStones" are seven, round, naturally tumbled red stones that were shaped by the rushing water at the bottom of a riverbed in Montana. They came into Sonara's possession as an exchange for a client's Soul Retrieval. When the session was finished, Sonara sat at an outdoor cafe in front of a grocery store shaking her head and wondering what on earth had ever possessed her to accept payment in the form of a bag of stones? Months later Sonara met a woman who talked to stones. She and Sonara journeyed to these seven river stones. Sonara was given guidance as to how to read them, what voice each would have and how to create the layout for the reading. 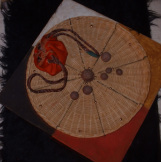 What you see in the photo below is the finished result; a medicine wheel layout, a yearly cycle and the relationships that the stones have to each other depending on where they land on the board. Would you like to hear what the TellStones have to say to you? Or what messages your Guides might be trying to tell you? Have you been listening or do you need some help? Click either link above to Purchase.